Risk appetite stages a come back in Asian session today as China pledged to “strive for a good start” in 2019. With Asian markets having broad based gains, New Zealand Dollar is leading commodity currencies higher. On the other hand, Yen is back under pressure, followed by Swiss Franc. Dollar is also weak while record US government shut down extends, after Trump rejected fellow Republican’s proposal of stopgap reopen. But overall, Sterling is the strongest one for the week as markets await the highly anticipated Brexit meaningful vote. 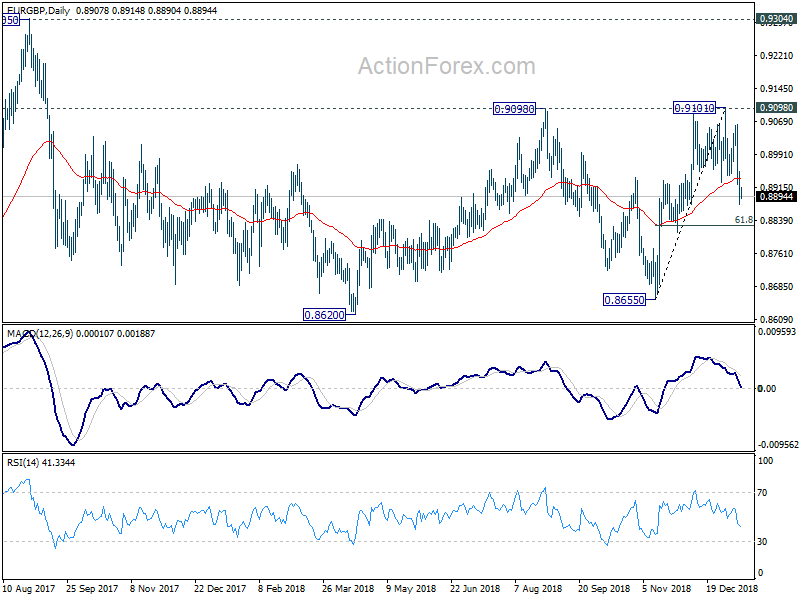 Technically, GBP/USD’s rebound from 1.2391 is extending towards 1.3174 resistance. 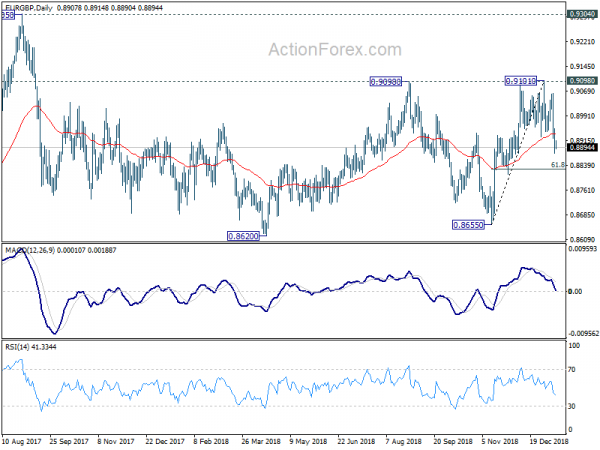 EUR/GBP took out 0.8927 support firmly yesterday and is now heading to 0.8825 fibonacci support. GBP/JPY breaches 139.88 resistance and sustained trading above the level could carry larger bearish implications. Talking about Yen crosses, both USD/JPY and EUR/JPY are displaying some strength and might try to recent recent rebound through last week’s highs. In other markets, Nikkei is back from holiday and closed up 0.96%. At the time of writing, Hong Kong HSI is up 1.88%. China Shanghai SSE is up 1.25%. Singapore Strait Times is up 1.51%. Japan 10 year JGB yield is down -0.0012 at 0.013, staying positive. Overnight, DOW dropped -0.36%, S&P 500 dropped -0.53% and NASDAQ dropped -0.94%. Treasury yields displayed strength at the long end. 30-year yield rose 0.023 to 3.060. 10-year yield rose 0.009 to 2.710. But US yield curve remains inverted from 1-year (2.596) to 2-year (2.537) to 3-year (2.508) and 5-year (2.522). The highly anticipated meaningful Brexit vote in the UK Commons will take place today. There is no exact time set, but it’s believed to be somewhere between 1900-2100 GMT. While the deal is widely expected to be voted down, May could force a second vote after the defeat. It’s reported that German Chancellor Angela Merkel is offering last-minute help to push for more EU concessions if the current deal is rejected. The concessions could include convincing Irish Prime Minister Leo Varadkar to agree to an end date to the so-called Irish backstop. Fed Vice Chair Richard Clarida reiterated Fed should take a “patient” stance in 2019 and decide on interest rates on a “meeting by meeting” basis. Though, he didn’t see the the global slowdown as “severe” for now. And he doesn’t see a recession “on the horizon”. Japan M2 rose 2.4% yoy in December. Eurozone trade balance will be featured in European session. Later in the day, US will release PPI and Empire State manufacturing index. EUR/GBP’s fall from 0.9101 extends to as low as 0.8875 so far. The break of 0.8927 support indicates near term reversal. 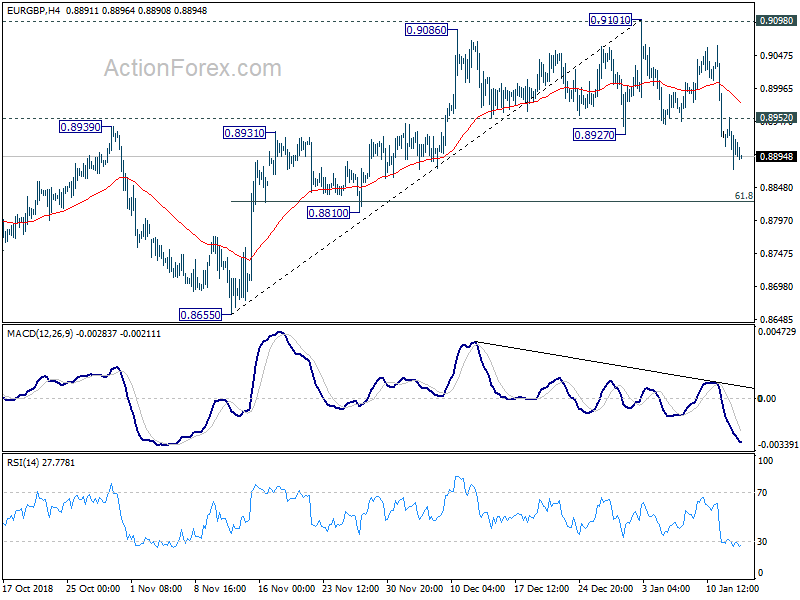 Intraday bias remains on the downside for 61.8% retracement of 0.8655 to 0.9101 at 0.8825. Sustained break there will pave the way back to 0.8655 support. On the upside, above 0.8952 minor resistance will turn intraday bias neutral first. But risks will stay on the downside as long as 0.9101 resistance holds. In the bigger picture, EUR/GBP is seen as staying in long term range pattern started at 0.9304 (2016 high). The medium term range is set between 0.8620 and 0.9101. 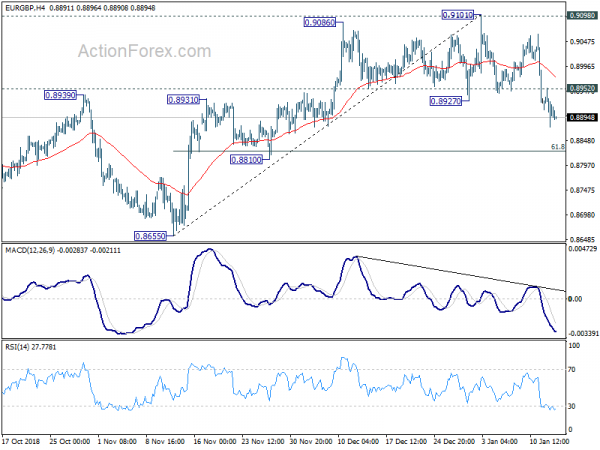 Downside break out of 0.8620 will pave the way back to 0.8302/12 support zone. Break of 0.9101 will bring retest of 0.9304/5 resistance.